Meditation is the latest of a series of spiritual practices that have surged in the past few year. Practices of meditation have been around for thousands of tears. These practices were usually limited to monasteries and groups that specialized in the practice.Wikipedia tells us that meditation can be defined as a practice where an individual uses a technique, such as focusing their mind on a particular object, thought or activity, to achieve a mentally clear and emotionally calm state. Meditation is practiced by all world religions and by agnostics and atheists. Why? Let’s take a look at what a few well known thinkers has said about meditation. To draw him from his holy exercise. Lord, help me to find the time to dwell upon you everyday. May I be guided to a special place that is quiet enough to hear even a whisper from you. At times prayer becomes silent. Peaceful communion with God can do without words. “I have calmed and quieted my soul, like a weaned child with its mother.” Like the satisfied child who has stopped crying and is in its mother’s arms, so can “my soul be with me” in the presence of God. Prayer then needs no words, maybe not even thoughts. How is it possible to reach inner silence? Sometimes we are apparently silent, and yet we have great discussions within, struggling with imaginary partners or with ourselves. Calming our souls requires a kind of simplicity: “I do not occupy myself with things too great and too marvelous for me.” Silence means recognizing that my worries can’t do much. Silence means leaving to God what is beyond my reach and capacity. A moment of silence, even very short, is like a holy stop, a sabbatical rest, a truce of worries. The turmoil of our thoughts can be compared to the storm that struck the disciples’ boat on the Sea of Galilee while Jesus was sleeping. Like them, we may be helpless, full of anxiety, and incapable of calming ourselves. But Christ is able to come to our help as well. As he rebuked the wind and the sea and “there was a great calm”, he can also quiet our heart when it is agitated by fears and worries (Mark 4). Remaining silent, we trust and hope in God. One psalm suggests that silence is even a form of praise. We are used to reading at the beginning of Psalm 65: “Praise is due to you, O God”. This translation follows the Greek text, but actually the Hebrew text printed in most Bibles reads: “Silence is praise to you, O God”. When words and thoughts come to an end, God is praised in silent wonder and admiration. At Sinai, God spoke to Moses and the Israelites. Thunder and lightning and an ever-louder sound of a trumpet preceded and accompanied the Word of God (Exodus 19). Centuries later, the prophet Elijah returned to the same mountain of God. There he experienced storm and earthquake and fire as his ancestors did, and he was ready to listen to God speaking in the thunder. But the Lord was not in any of the familiar mighty phenomena. When all the noise was over, Elijah heard “a sound of sheer silence”, and God spoke to him (1 Kings 19). Does God speak with a loud voice or in a breath of silence? Should we take as example the people gathered at Sinai or the prophet Elijah? This might be a wrong alternative. The terrifying phenomena related to the gift of the Ten Commandments emphasize how serious these are. Keeping or rejecting them is a question of life or death. Seeing a child running straight under a car, one is right to shout as loud as possible. In analogous situations prophets speak the word of God so that it makes our ears ring. When God’s word becomes “a sound of sheer silence”, it is more efficient than ever to change our hearts. The heavy storm on Mount Sinai was splitting rocks, but God’s silent word is able to break open human hearts of stone. For Elijah himself the sudden silence was probably more fearsome than the storm and thunder. The loud and mighty manifestations of God were somehow familiar to him. God’s silence is disconcerting, so very different from all Elijah knew before. Silence makes us ready for a new meeting with God. 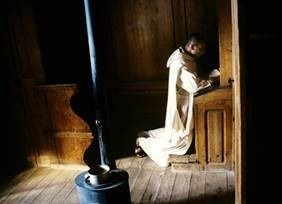 In silence, God’s word can reach the hidden corners of our hearts. In silence, it proves to be “sharper than any two-edged sword, piercing until it divides soul from spirit” (Hebrews 4:12). In silence, we stop hiding before God, and the light of Christ can reach and heal and transform even what we are ashamed of. Christ says: “This is my commandment, that you love one another as I have loved you” (John 15:12). We need silence in order to welcome these words and put them into practice. When we are agitated and restless, we have so many arguments and reasons not to forgive and not to love too easily. But when we “have calmed and quieted our soul”, these reasons turn out to be quite insignificant. Maybe we sometimes avoid silence, preferring whatever noise, words or distraction, because inner peace is a risky thing: it makes us empty and poor, disintegrates bitterness and leads us to the gift of ourselves. Silent and poor, our hearts are overwhelmed by the Holy Spirit, filled with an unconditional love. Silence is a humble yet secure path to loving. Note:This post was copied from the Taize community website with some editing.